I decided to go to youtube to see what a search for Taekwondo Techniques would yield. One of the first things that popped up was a video of a young instructor talking about a lower block technique. Eric, the ITF guy above seems to be a fairly good instructor. He speaks clearly and builds up sequential information nicely. In fact, he's performing better for the camera than Master Instructor Syd in the next video below. Both instructors are really performing the same hardan marki low block. Syd looks like he's doing it straight out of GM Jhoon Rhee's 1970s textbook, Eric on the other hand looks he's performing the block with a modified fold so that arms are crossed in front of the practitioner before the blocking arm is sent out. When we work on the lower block or any block for that matter, the folding of the block around the body is tactically important to us. Syd for this particular block, folds the arm high - with palm facing the ear. It is this raising of the arm and swinging it across the body that helps provide cover and allows us to deal with strikes to the face or centreline. Look at this picture I nicked off Google. Nice relaxed deflection and parry of the oncoming strike. That's how that folding works when we practice this block on a line drill. Notice too how this guy above has his head dropped. 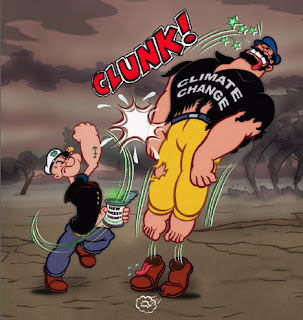 We don't want to have our chin jutting out and getting one on the kisser (see How Not to Get Punched in the Nose). The head position helps reduce the size of the target and allows you to take some force and dissipate it into your skeleton if absolutely necessary - rather than having it end up in your neck. The following is an image that's from my buddy Soo Shim Kwan's blog. While this is his prelude to an arm bar, this is what you're missing from a low block if you fold your arms too low. Now I'm not saying that the ITF version is wrong - it's just different. 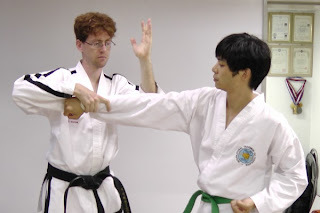 As for the formation of the fist - while Eric is correct in that we strike with the first two knuckles, that's not how the fist is chambered or how it is held when folded together for the block. When the fist is close to your body, it looks more like a hammerfist. In fact, the wrist is more or less relaxed when held this way, and only should start to tense up fully during the act of striking a target. This allows the wrist to flex and 'present' the front face of the first two knuckles that you punch with. If you're punching of course. If you're hammering someone's groin like in the photo below it's still done as a hammerfist strike. As with all other strikes - the weapon you choose is only the 'end manifestation' of everything that started from the feet, knees, hips, trunk, shoulders and arms. I.e. there is tactical sense to choose a different weapon to match an opening, then your fist should be relaxed until it presents the right tool to do the job. Once I had a boxer come visit my dojo, and he had a heap of exposure to the martial arts and expressed his dismay that many of the schools he went to weren't teaching any practical skill to the beginner. He also said that he just couldn't understand any of the blocks. We go into a discussion and I asked him how long it would take for a beginner to learn how to punch more or less correctly, and his reply was anywhere between several weeks to several months. 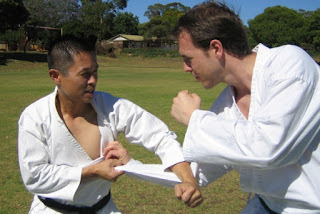 Then we go into a discussion of a low block and a hammerfist strike - the ease of doing this was compared with the punch and we both agreed that it was far simpler for a beginner to learn and do a low block motion. That's when I asked him to grab me with his arm and I literally hammered his forearm. Yep, I used a low block and I hammered his arm - not full force mind you - and you should have seen his eyes wide with the realisation. It's the wakeup call of someone holding your arm still and slamming the edge of their forearm against the top of your forearm. Or of course it could be your bicep, or inside of the elbow. Or your groin, neck, solar plexus, back of the hand, etc. This is not something you 'exchange' and isn't something you can 'take' and keep standing. The shearing force between both the arms is powerful and makes for a potent strike. As you can see, I'm not using it against a front kick in a kodak moment ... and with a simple example, I've made an expert boxer aware of the fact that a beginner can do something like this safely and powerfully ... and very soon after they start training. HOly Cow Colin! Where do you find the time to make such awesome posts????? CUDOS to you. TO be fair I've been doing good work both for martial arts and for my company. So it's thumbs up all round.